I was nominated for my first blogging award! I always see these awards around, and have always been curious about them, so I am very glad I get to partake! Thanks to Laurissa at Lest Twenty Two for nominating me. Go check out her comics- they are very entertaining! A. You find yourself in a desolate place when your car breaks down. You have no cell phone service, no stores, and only a candy bar for food. It is 150 miles to the closest town. What color are your pants and why? B. You find yourself having to ride an elevator quite frequently. How do you pass the time to show off your creativity? 4. Then you are to nominate 5 random people and let them know. Here goes nothing, except my attempt to answer them to the best of my abilities. I tell stories about people from my life, using their full names. My current friends tease me about this, because they are like, “we don’t know this person- why are you telling us about them and using their full name! ?” However, I do it because I truly feel like someday my friends from various parts of the world will know each other, and it has even happened quite a few times so far- a lot of my friends from New Mexico have met my Seattle friends, and a lot of my friends from South Dakota have met my other Washington friends. Someone from Austria has met a London friend, etc. I sometimes cover cans of food with saran wrap, instead of putting them in a Tupperware. Not only is that weird, but my roommate recently told me it may give me some sort of disease, which would be dreadful. I pull on my earrings when I get nervous. 2. I don’t know if I fully understand the question for this one, but here’s my answer anyway: I look at the glass half full because when I say, “what, where is the coffee?” I end up having too much caffeine and getting the jitters. B. I’d make up songs about the predicament and sing them to myself, and dance around the elevator. 4. Who to nominate? Do you guys know how many blogs I visit every day? Literally hundreds, on a slow day. There really isn’t criteria, but I will chose 5 of the text or art-based blogs I read the most, whose blogs are king of my “feel good” sites, and who post more than once a month. My first nomination goes to Little Wolf, an illustrator in Portland who portrays every day Portland characters in fun and quirky drawings. The second goes to one that really cracks me up, Kate, Cracking Up. She’s funny! I always read Hour of Gold as well, for her personal and entertaining recitations, stories of vegetarian adventures, and some doses of sarcasm. I appreciate her conversational style. The blog Mile High Healthy gives me a daily dose of inspiration for healthy living and has a lot of tasty salad recipes. I love salads, and have a not so secret love of both the Colorado Rockies and food blogs, so this one kind of combines a bunch of my favorites. I am constantly surprised that the blogger of The Last Classic is young (17ish). She is very eloquent, and the style of her site is really fun. I always enjoy her posts, especially about reading and authors. Other recommendations, and close contenders who deserve some link love: The humor blog Cereal with a Fork is definitely a go-to for me on writing days. One of my favorites is the 3/28 post. I love the blog Diatribes and Ovations, and it was one of the first sites I followed here on WordPress. The site Masculinity U is also very good for masculinity studies and gender topics, although I am not sure who would answer these questions since they have multiple authors. And, last but not least, the young blogger over at Operation Equality is very impassioned and it is fun to watch her learn about and take action for social justice issues. What is this, you ask? 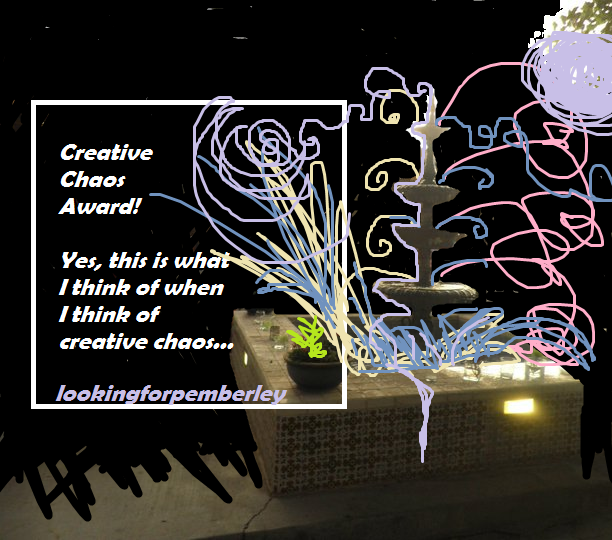 A creative fountain of chaos, of course. Thanks again Laurissa for the nomination! This entry was posted in Fun and tagged cereal with a fork, Creative Chaos Award, creativity, diatribes and ovations, Hour of gold, Kate cracking up, Lest Twenty Two, little wolf, Masculinity U, mile high healthy, operation equality, Portland, The last classic. Thanks! 🙂 I enjoy your wine notes very much, so your comment means a lot! Ha ha- yeah, good point! Congratulations! Here’s wishing you many more..you deserve it!